This topic gives you step-by-step instructions to make your email messages accessible to people with disabilities. People who are blind or have low vision can understand your emails more easily if you create them with accessibility in mind. 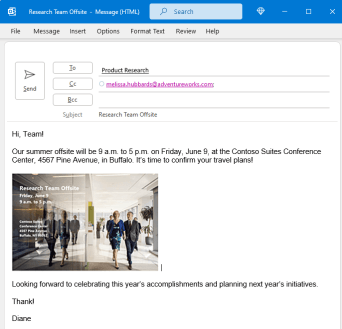 The following table includes key best practices for creating Outlook email that is accessible to people with disabilities. The text in your email should be readable in High Contrast mode so that everyone, including people with visual disabilities, can see it well. For people who have dyslexia or have low vision, reduce the reading load. For example, they may benefit from familiar sans serif fonts such as Arial or Calibri. Avoid using all capital letters and excessive italics or underlines. Include ample white space between sentences and paragraphs. 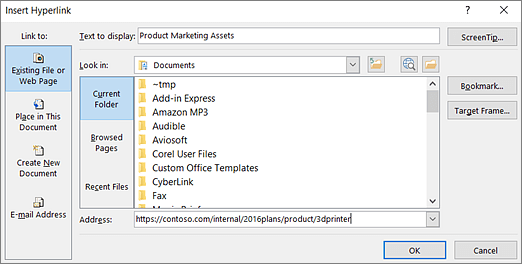 To preserve tab order and to make it easier for screen readers to read your email, use a logical heading order and the built-in formatting tools in Outlook. For example, organize headings in the prescribed logical order. Use Heading 1, Heading 2, and then Heading 3, rather than Heading 3, Heading 1, and then Heading 2. And, organize the information in your email into small chunks. Ideally, each heading would include only a few paragraphs. 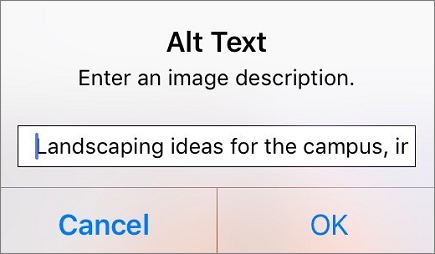 Add alt text to images, such as pictures, screenshots, icons, videos, and 3D models, ﻿so that screen readers can read the text to describe the image to users who can’t see the image. Right-click a shape or SmartArt graphic. and screenshots, so that screen readers can read the text to describe the image to users who can’t see the image. 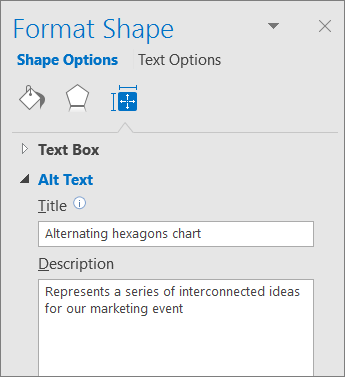 Select Format Shape > Layout & Properties. 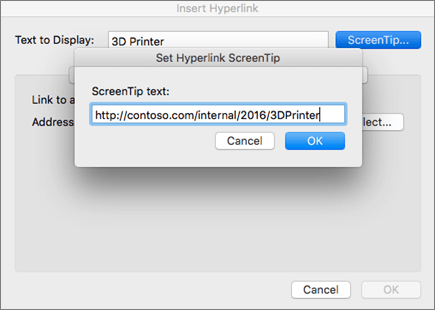 The following procedures describe how to make the hyperlinks, text, and tables in your Outlook email accessible. Select the text to which you want to add the hyperlink, and then right-click it. Select Link. 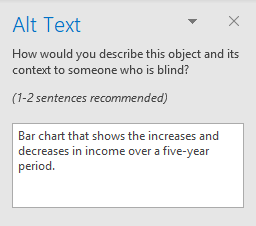 The text you selected is shown in the Text to display box. This is the hyperlink text. If necessary, change the hyperlink text. In the Address box, type the destination URL. Select the Format Text tab. 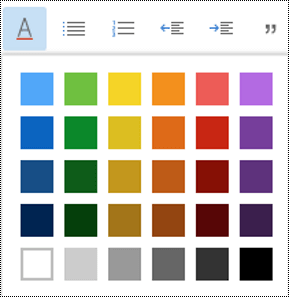 To ensure that text displays well in High Contrast mode, use the Automatic setting for font colors. Select Message > Font Color. 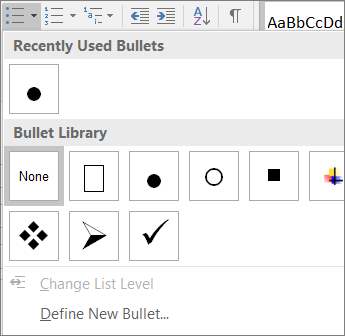 Create bulleted lists by using the Bullets button. Position the cursor anywhere in your email. 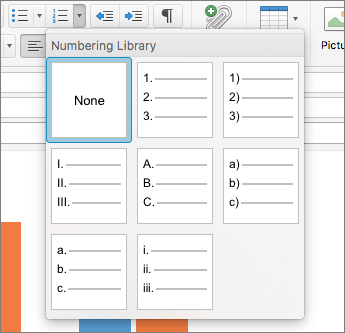 Create sequential steps by using the Numbering button. In the Paragraph group, in the lower-right corner of the group, select the Dialog box launcher button. 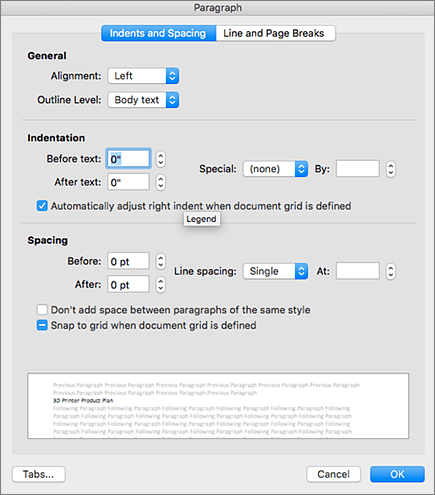 The Paragraph dialog box opens, showing the Indents and Spacing tab. Specify a header row in a table. 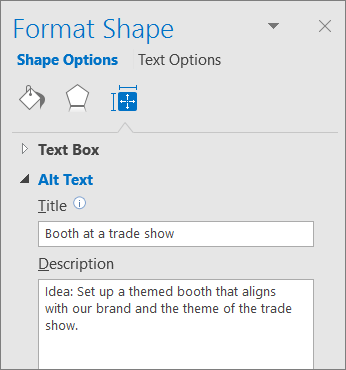 On the Table Design tab, in the Table Styles group, select the Header Row check box. Let a sender know that you prefer to receive accessible content. To go to your account on the web, in Outlook, select File > Info, and then in Account Settings, click the link under Access this account on the web. In Outlook on the web, to go to Accessibility Settings, select > Mail > General > Accessibility settings. To request accessible content, select the Ask senders to send content that’s accessible checkbox. Avoid using text in images as the sole method of conveying important information. 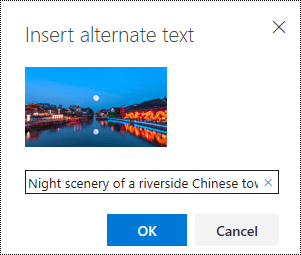 If you must use an image with text in it, repeat that text in the document. In the alt text, briefly describe the image and mention the existence of the text and its intent. For example, use bright colors or high-contrast color schemes on opposite ends of the color spectrum. White and black schemes can help people who are colorblind distinguish between colors. Use headings and built-in styles. For example, organize the information in your email into small chunks and add headings above them. Ideally, each section would include only a few paragraphs. 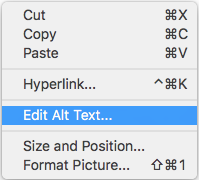 The following procedure describes how to add alt text to visuals in your Outlook email in Office 365 for Mac. Right-click the image in your email. 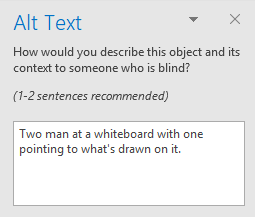 Type 1-2 sentences to describe the image and its context. Add alt text to images, such as pictures and screenshots, so that screen readers can read the text to describe the image to users who can’t see it. Select the text to which you want to add the hyperlink, right-click the text, and then select Hyperlink. 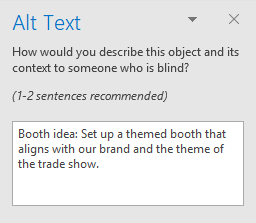 The text you selected displays in the Text to Display box. This is the hyperlink text. Type each sequential step in the ordered list. Select your text, right-click it, and then select Paragraph. The following table includes key best practices for creating an Outlook for iOS email that is accessible to people with disabilities. 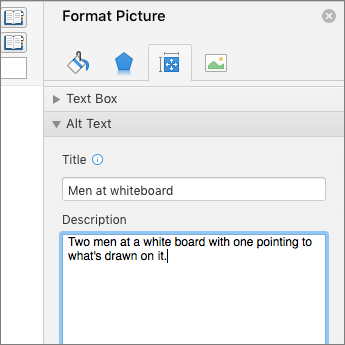 Include alternative text with pictures. Avoid using text in images as the sole method of conveying important information. 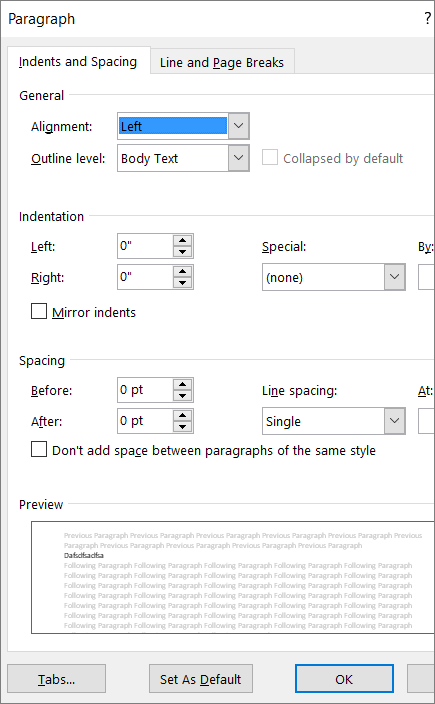 If you must use an image with text in it, repeat that text in the document. 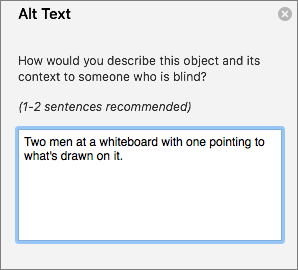 In alternative text, briefly describe the image and mention the existence of the text and its intent. Add alternative text to images, such as pictures and screenshots, so that screen readers can read the text to describe the image to readers who can’t see the image. In the email you are composing, double-tap an image to open the context menu. In the context menu, tap the Alt Text button. To add the text and exit the dialog, tap OK.
Add a meaningful hyperlink text to help screen reader users easily scan your email for links. In the email you are composing, select the text to which you want to add the hyperlink. To open the context menu, tap the selected text. If necessary, at the end of the menu, tap until the Add Link button is displayed. Tap the Add Link button. 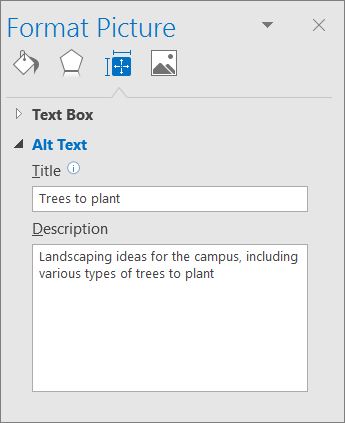 If necessary, change the hyperlink text in the Text field. In the Link field, type the destination URL. To insert the hyperlink, tap . The following table includes the key best practice for creating an Outlook for Android email that is accessible to people with disabilities. To add the text and exit the dialog, tap SAVE. In the email you are composing, select the text to which you want to add the hyperlink. The context menu opens. Tap the ADD LINK button. 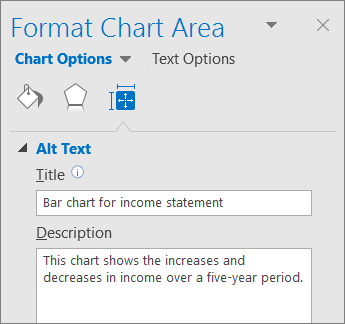 If necessary, change the hyperlink text in the Text to display field. To insert the hyperlink, tap the SAVE button. Note: We're currently updating Outlook.office.com (Outlook on the Web). Some people are already using the new Outlook, and for others the classic version will be the default experience until we complete the update. For more information, go to Get help with the new Outlook on the web. Since the instructions in this topic apply to the new experience, we recommend that you switch from the classic experience to the new Outlook. To switch to the new Outlook, toggle the switch in the top right corner to Try the new Outlook. Use a simple table structure. When you're composing an email, select an image in the message body. To display the formatting toolbar, select (Show formatting options), if necessary. 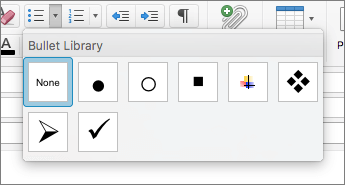 In the toolbar, select (Add alternate text to image). Instead of displaying the URL as the link text, type a meaningful hyperlink text. When you're composing an email, type a meaningful link text in the message body. Select the link text, and then press Ctrl+K. 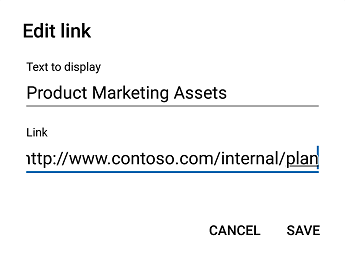 The Insert link dialog opens. In the Web address (URL) text field, type the destination URL and select OK. 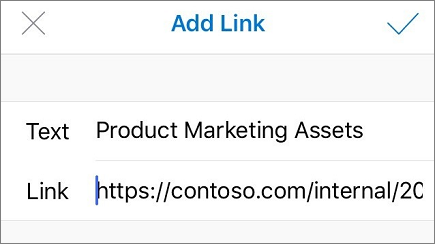 When you add a URL to an email in Outlook.com or Outlook on the web, or when you receive an email with a URL in the body, you'll see a rich preview that includes a link title, thumbnail image, and description of the link. This is called a link preview and it is turned on by default. In the Settings pane, select Mail > Compose and reply. Under Link preview, clear the Preview links in email check box to turn off link preview. Use a familiar font type and large enough font size to help people who have dyslexia or have low vision read your email more easily. 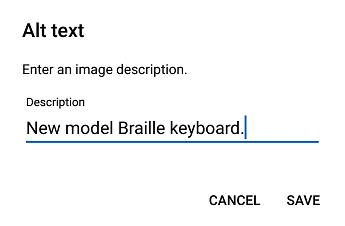 To change the font type, select (Font). 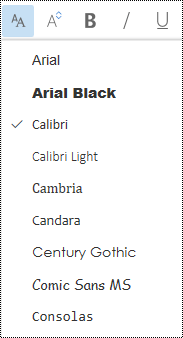 In the Font menu, select the font type you want. 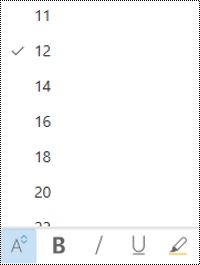 To change the font size, select (Font size). In the Font size menu, select the size you want. To ensure that text displays well in High Contrast mode, use black for the font color. 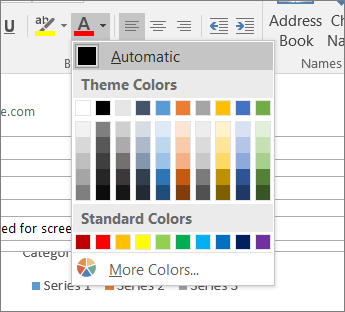 In the toolbar, select (Font color). 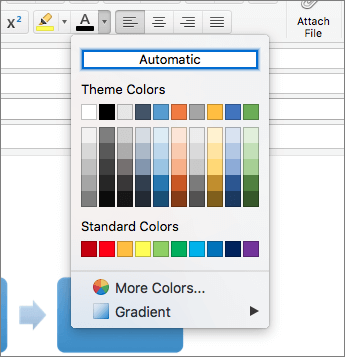 In the Font color menu, select the color you want. Create bulleted lists to add structure to your text. Place the cursor anywhere in your email. In the toolbar, select (Bullets). 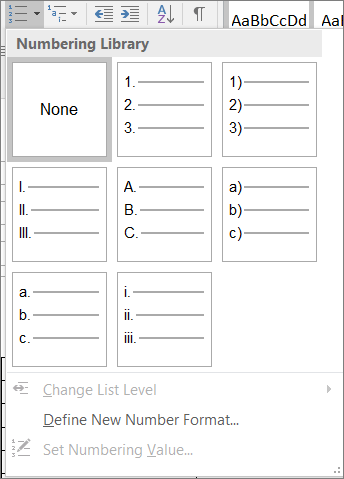 Create ordered lists to organize your text into sequential steps. In the toolbar, select (Numbering). Type each numbered item in the list. Adding tables inside tables or leaving cells empty may make your emails difficult to read with a screen reader. Consider using simple tables that make it easier for the screen readers to identify the table, rows, and columns. In the toolbar, select (Insert table). 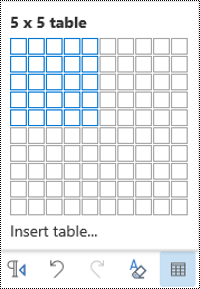 In the Insert table grid, select the area of rows and columns to be added.